This last LRTA tournament of the season lived up to its reputation as a happy, social weekend with competitive tennis, sometimes with mountainous handicap differences but always played in a great spirit - and the weather was wonderful too! As well as many old, familiar faces, there were some new ones too, which is always good to see. Several of the group matches went to 5 – 5 with long rests and good play. In 4 of the groups the winners won all their matches with a good spread of local pairs and visitors, reducing the home players handicap by 3 really evens out the play as Seacourt is a very different court to play on from most of the others. Although the eventual winners came second in their group they always felt a strong pair, it was Simon’s first time in the Mixed but Katie certainly asked the right partner. The knock outs started with the defending champions, Sian Medlow & William Flynn (owe15) playing Candida Nicholls & Paul Heaver (rec 30). It was a close match but the handicap was just too much and the defending champions went down 4/6. Next on were Sue Bicheno & Chris Halliwell (owe half 15) against Barbara & Donald Carse (love). Sue’s uniquely strung racquet served her well, and her colour co-ordinated grip, wrist band and towel (all very pink!) brightened up the court! She volleyed well and Chris was on top form, but the Carses hung on in there, it was neck and neck to 5 all, 40 all, when Barbara & Donald took that vital point and the match. There was more of a handicap difference in the next match when Katie Leppard & Simon Constantine (owe 30) took on a pair new to the tournament Cath McNeill & Chris Handley (rec half 15). This was another close match, with Katie serving and volleying well whilst Simon covered the court and kept finding the winning gallery as they had to fight back from owe 30. Cath & Chris played well together, using Chris’ experience and speed around the court. Again, the dedans was on the edge of seats as it went to 5 all, 40 all, and the last point was a great rest with Simon and Chris firing the ball along the main wall, but Simon produced an unreturnable shot so he and Katie were the winners, 6/5. An even bigger handicap match came next, Jess Garside & Simon Flynn (owe 40) against another couple of locals, Doris & Geoff Oldland (rec 30). In a couple of early games Jess & Simon fought their way to 40 all, only to lose the next point. But, nothing daunted, they got to 5 all. But it was 40/owe 40 - just too much! Doris & Geoff had the benefit of a lucky half a yard chase, which the others couldn’t beat so the wily Oldlands were through, 6/5. 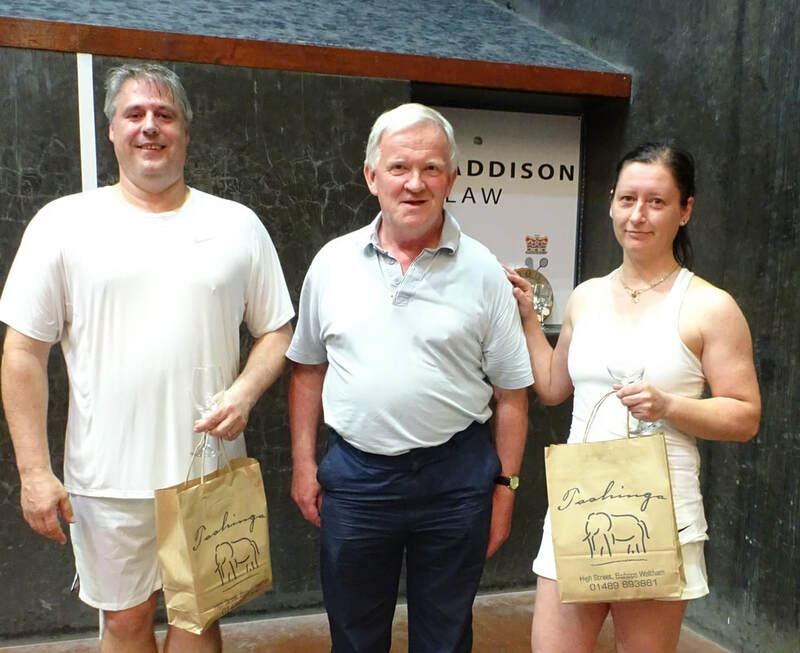 Sadly the next match, Candida & Paul v Rosie & Graham Law came to an end when Paul suffered an injury, with the score at 2-1. We wish Paul a speedy and full recovery and hope to see him back at Seacourt next year. Barbara & Don (owe ¼ 15) then took on the ‘new to the Mixed’ pairing of Zuzana Botkova & Yuri Kugler (love). The newcomers kept their cool, and after some good rests, took the match 6/2. The first semi-final saw locals Rosie & Graham (rec half 15) face Katie & Simon (owe 30). 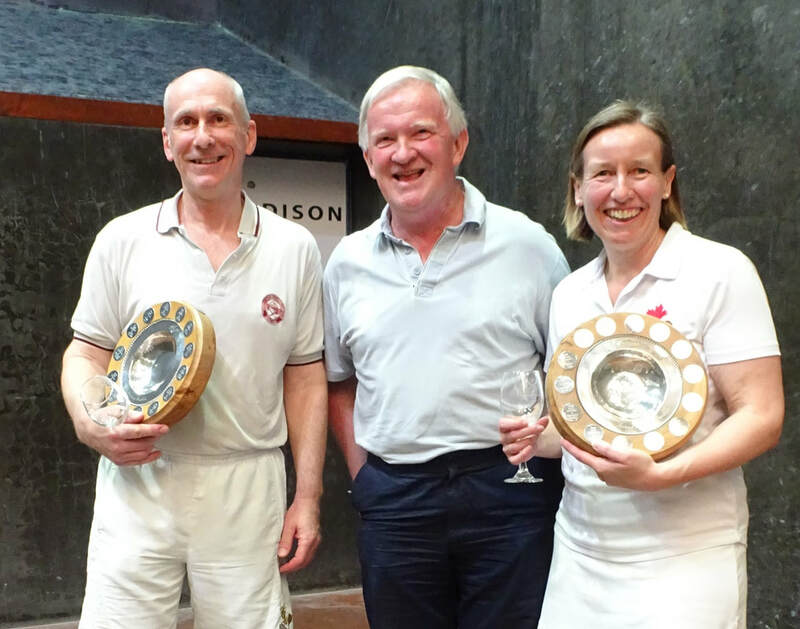 There were some excellent rests and great defensive play by Rosie & Graham but Katie & Simon were very consistent - and by now rather used to facing mountainous handicaps - they won 6/2, but that really doesn’t do justice to the standard of Rosie & Graham’s play. ​The second semi was the wily locals, Doris & Geoff (love) against Zuzana & Yuri (owe half 15). The latter started so well, making hardly any mistakes and were 3/0 up. But then Doris & Geoff dug in, the next three games went to 40 all and they won all three, so it was 3/3. There were some interesting calls from the locals, Doris shouting ‘You’ then ’Me’, but luckily for her Geoff took it anyway and hit a winner! Then Geoff called ‘You’ but realised he needed to spin round and take the ball himself, which he did, much to the amusement of the dedans! But there were then some great retrieves by Zuzana & Yuri and they took the match 6/4. So then it was the final! Katie & Simon (owe half 30) facing something of an uphill fight against Zuzana &Yuri (rec half 15) who were in the final in their first Mixed Handicaps doubles tournament. The newcomers took advantage of the handicap and went to 2/0 ahead but Katie & Simon didn’t give up, Katie continued to serve and volley well, with Simon covering the rest of the court, and they were clearly wanting to monopolise the service end, which helped them win the next six games, so they were leading 6/2 but Yuri was certainly not giving up and they won the next 2 games and went to 40 all in the next but again Katie served well and with Simon retrieving at the back they won the last point and then went on to take the match 8/5. Katie certainly seems to be on a winning streak as this year she has won the Billy Ross Skinner Invitation Mixed Doubles, last week the French Handicap singles and now this!! What next for her! A very big thank you to our sponsor, Addison Law and Chris Halliwell. Chris is such a great supporter of this tournament and is welcoming to all who come to it, as well as a keen competitor! And we are very grateful to him for the splendid Pimms reception on Saturday evening - a perfect prelude to the dinner! Very many thanks must go to Viv Dawes for running such a happy tournament, with no sign of stress or fretting even when matches overran or players who should have arrived hadn’t… and thanks to Aaron and Adam Phillips, who marked all the matches in a very friendly way, always being ready to start play as soon as the players were ready. Thank you also to Lucy for buying the prizes and for bringing the LRTA clothing to the tournament, I think she made a few sales. Thanks to Seacourt for letting us have the court for so much of Friday, Saturday and Sunday, for putting on a very enjoyable dinner and for the hospitality of those local members who kindly put up players who came from afar.